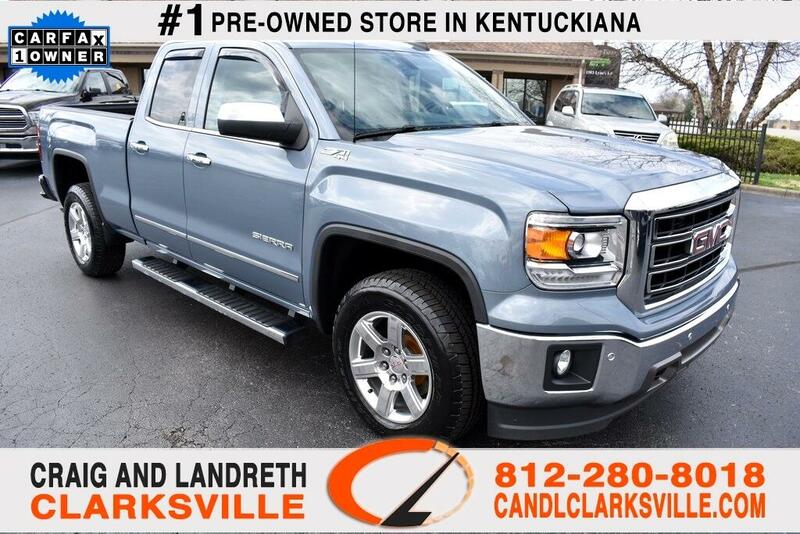 CERTIFIED BY CARFAX - ONE OWNER AND NO ACCIDENTS 2015 GMC SIERRA SLT ** 4WD/4X4/AWD ** ONLY 39,000 MILES ** HEATED LEATHER SEATS ** HEATED STEERING WHEEL ** TOW PACKAGE ** RUNNING BOARDS ** TOUCH SCREEN ** BLUETOOTH ** REMOTE START ** THIS IS A NON SMOKER TRUCK THAT HAS BEEN GARAGE KEPT ** SUPER CLEAN CARFAX AND THE SERVICE RECORDS ARE IMPECCABLE ** TONS OF OPTIONS!!! ** THIS TRUCK IS LIKE NEW AND DOESN'T NEED A THING ** WHY PAY THE DIFFERENCE IF YOU CAN'T TELL THE DIFFERENCE?! WHY BUY NEW?! YOU WILL NOT BE DISAPPOINTED WITH ANYTHING ON THIS VEHICLE! ANY QUESTIONS CALL RICHARD SPAN, JAKE SMITH, OR JIMMY SMITH JR AT 812-280-8018!! WE'VE NEVER LOST A DEAL WHEN IT CAME TO PRICE OR QUALITY!! Fresh oil change, White glove detailed, 110 point safety inspection, Bluetooth, USB, Heated Seats, Remote Start, Keyless Entry, Rear View Camera/ Backup Camera, Satellite Radio/ Sirius XM, Leather Seats, 2nd Row Bench Seating, Parking Sensors, Towing Package, Bed Liner, 4WD, All Wheel Drive, Non-Smoker, Lots Of Options, Backup Camera, Premium Package, Premium Plus Package, Premium Sound Package, Premium Wheels, Tow Package, Trailer Package, Z 71 Package, Certified. Certified by CarFax., 6-Speed Automatic Electronic with Overdrive, 4WD, Jet Black w/Leather Appointed Seat Trim, ABS brakes, Chrome Door Handles, Compass, Dual-Zone Automatic Climate Control, Electronic Stability Control, Emergency communication system, Front dual zone A/C, Front Frame-Mounted Black Recovery Hooks, Heated door mirrors, Heated Driver & Front Passenger Seats, Heated front seats, Illuminated entry, Low tire pressure warning, Power Adjustable Pedals, Power Folding & Adjustable Heated Outside Mirrors, Rear Vision Camera w/Dynamic Guide Lines, Remote Keyless Entry, Remote keyless entry, Remote Vehicle Starter System, Single Slot CD/MP3 Player, Traction control, Trailering Equipment. Odometer is 1349 miles below market average!